Jersey City, V. 1, Double Page Plate No. 32 [Map bounded by Secaucus Rd., Nelson Ave., Thorne St., Pen Horn Creek] / compiled under the direction of and published by G.M. Hopkins Co.
Topographical atlas of the City of New York / by Egbert L. Viele. from Topographical atlas of the city of New York, / including the annexed territory showing original water courses and made land / prepared under the direction of Egbert L. Viele. Jersey City, V. 1, Double Page Plate No. 31 [Map bounded by Thorne St., Hudson Blvd., Hackensack River, Pen Horn Creek] / compiled under the direction of and published by G.M. Hopkins Co.
Dutch Era Land Grants in Stokes Iconography sheet with Greenwich Village & Lower Manhattan. Map of New York, Brooklyn, Jersey City& c.
Map of the City of New York with the adjacent cities of Brooklyn & Jersey City, & the village of Williamsburg. Amap of the city and county of New York, with the adjacent cities of Brooklyn and Jersey City, and the village of Williamsburg: with a street directory of the city of New York. New York City south of 93rd Street. Citizens and Travelers' Guide map in, to, and from the City of New York and adjacent places. Elevated railway map of New York, Brooklyn, and Jersey City. Taunton's pocket edition of the merchant's and shipper's guide map to the port of New York / S.D.L. Taunton. 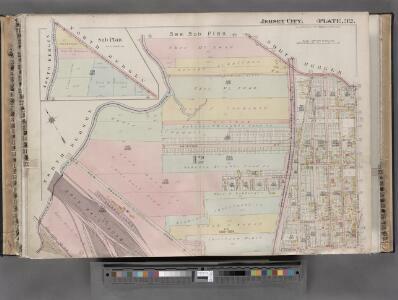 Colton's new map of the city and county of New York [North and South of 93rd St.] including the extension north of the Harlem River. Map of the cities of New York, Jersey City, Hoboken, with part of Brooklyn. Outline and Index Map of Atlas of New York City : Manhattan Island. Outline & Index Map of New York City. Index I.